The pineal gland is known as the master gland, and is also the gland that governs our third eye, making it the center of psychic awareness in the human brain. It is smaller than a kidney bean and is located inside a ‘cave’ behind the pituitary gland. This amazing gland produces the hormone melatonin, which regulates daily body rhythms that deal directly with day and night cycles. Many people don’t realize how important this gland is, it affects every system in your body physically and it has the potential to determine expansion and contraction of your psychic awareness, consciousness, and experience with the divine, therefore the energy of your pineal gland, as it is developing and expanding. A good way to stimulate your pineal gland is by nourishing it, the best way to do that is through direct sunlight, in fact sunlight should be enjoyed for at least 30 minutes a day, and to fully engage the pineal gland sunlight should be taken through the pupils, the best time to do this is from 6:00am to 7:00am, since this nourishesyou without hurting your eyes or skin. What you eat is important, try to include sun-dried veggies like seaweed and tomatoes, vegetables that contain high amounts of vitamin D, many vitamins in the B-vitamin family, and iodine-rich foods kombu, arame, wakame, dulse, and nori. 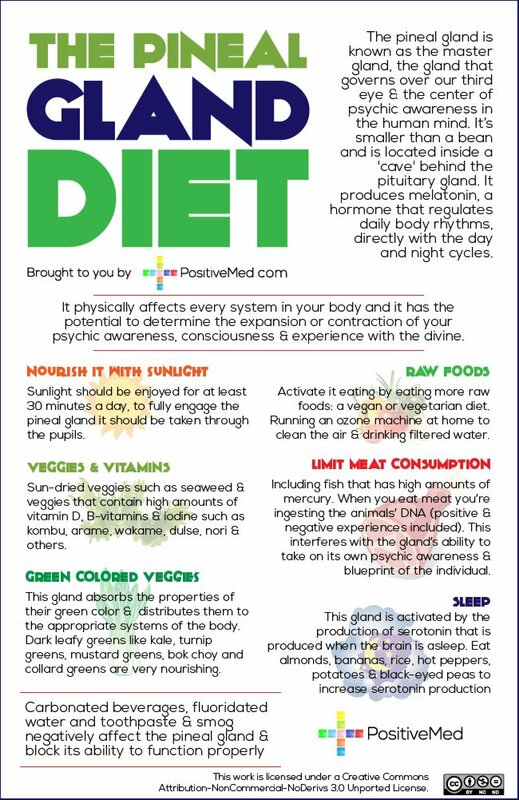 The pineal gland absorbs the properties of the green color in the vegetables and properly distributes them to the appropriate systems of the body. Dark leafy greens like kale, turnip greens, mustard greens, bok choy, and collard greens are extremely nourishing. Limit meat consumption, including fish with high amounts of mercury. Carbonated beverages, fluoridated water and toothpaste, and smog negatively affect the pineal gland and can block its ability to function properly. When you eat meat you are ingesting the animal’s DNA, including the positive and negative experiences of the animal, which interferes with the ability of the pineal gland to take on its own psychic awareness and blueprint of the individual. Activate your pineal gland by eating by eating more raw foods, adopting a vegan or vegetarian diet, running an ozone machine in your home to clean the air, and drinking filtered water. Sleep is important, the pineal gland is activated by production of serotonin, produced when the brain is asleep. Eat almonds, bananas, rice, hot peppers, potatoes, and black-eyed peas to increase serotonin production, which can also nourish and feed the pineal gland.